I'm starting with my favorite of the bunch! The formula for all of these are great! Jindie Nails I'm a Star Dot Com is so so playful. This is 3 coats with careful application. The formula is good, it's just, with any polish chocked full with this many goodies, you have to apply carefully and use the dabbing method sometimes to get the glitters evened out. 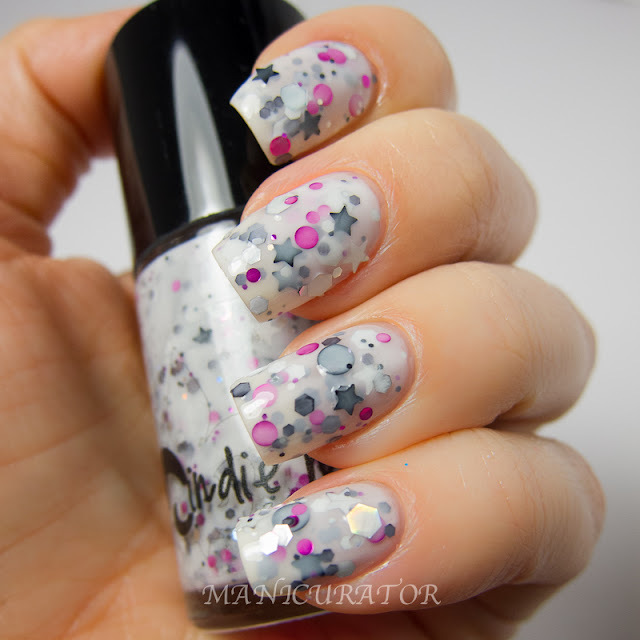 Jindie Nails Candy Land Remix is another fun fun fun polish. I used three coats and had no problems with application. I love how thin the large neon hexes are, they lay flat around the nail curves so easily. Jindie Nails Barney Blew Up is a pinkypurple crelly base with a slight shimmer and purple, white and green glitters with white hearts. This is 3 coats. This one gave me the most trouble as far as application from the bunch. It just took more time and patience to get the crelly at full coverage vs glitter overload. In the end though...so worth it! Jindie Nails Strung Out on Compliments Yellow and blue micro neons glitters with micro black in a clear base. This is one coat over 2 coats of OPI I Theodora You. Very easy to work with and love the look and that you can layer it over different polishes, obviously. Do you have any Jindies? Which are you faves? I find her polishes incredibly creative and always fun! Want them all! They're lovely! I just got some of the Jindies and they were awful. I got Hot Pink Floyd and it was so hard to apply, it took 4 coats and I got Barney Blew Up (streaky) and Princess breath (Streaky) and they were also hard to apply. Oh no! :( Sorry to hear that! Did you contact her? I'm sure she'd make it right for you. Did you use top coat over the two chunky glitters? Nossa, coisa mais lindas estes esmaltes gente... babei aqui!! Este Jindie Nails I'm a Star Dot Com é simplesmente maravilhso!! Victoria, if you had any streaking issues with any of these polishes, please feel free to give your honest opinion as that's what I need to improve as a small business. I think you have all of those except Hot Pink Floyd. I've not heard this about any of the polishes mentioned from any customers or bloggers before, especially Princess Breath. Hot Pink Floyd is a thicker base since it's matte finish, but I haven't heard of it being too difficult to work with & didn't have any issues with it, other than the matte base being thicker. Adding a little thinner to it may help, but I haven't personally tried that. If anyone ever has any issues with any of my polishes, email me and I'm happy to work with you. Like I mentioned, this is the first time I've heard of any problems with any of those polishes. If you purchased the polishes from a stockist, please let me know which stockist it came from. Lena Payne, I looked you up on my website and didn't find you so if you could let me know which stockist you purchased your Jindie's, we can work together until you feel like you are happy with the outcome. If you can, email me your info and if possible, upload pics of the problems you are having so I can try to figure out what happened to the formula and why yours is different. If anything, take a pic of each problem shade on just one fingernail. I need for my customers to let me know of any problems so I can take care of them. It's my goal to keep you as a customer and this can easily be resolved! So sorry you had problems with the polishes, I hate to hear that :(! Love your swatches Victoria!! Blue Ivy is just gorgeous! O.M.Gosh, you are so amazing at what you do! I ♥ you :)! Thanks for the response here Jen!! I am ALWAYS honest in my reviews, that's the point of a review, right? I had no problems at all with Princess Breath, only Barney Blew up was hard for me to get an even coverage, but I did, so it's not even that bad of a problem that would need "fixing", and you are right, I don't have Hot Pink Floyd. Yup, for sure. I used HK Girl. Thank you!! :) Yes, and it's even more gorgeous in person! Blue ivy looks amazing, I want it! WHYYYYYYY would you do this to me!?!?!? I'm having a tough time getting off this page. I could droll over these allll day! I have Hot Pink Floyd and reviewed it on my blog and had no issues with it at all.